Click HERE to download our complete guide to moving to France – it’s the perfect guide to start you off on your French property dream. Jackie Cole, from Stockwell, South London, recently bought her second property in France, following on from her first in 2000. As such, she knows exactly what it takes to buy property there – if you’re thinking of doing the same, it’s worth hearing what she has to say. “I’m a journalist. I do lots of stories in France, lots of features in France, and I read French at University, so it was always something I wanted to do. Is buying property in France a daunting process? “Well, I speak French, so that’s the big thing. I think if you don’t speak the language, it’s more difficult. It’s not complicated, but it is very bureaucratic. You have to know the ground rules. So, if you’re looking through an agent, for instance, there are always agency fees. These used to be 6%, now I think they’re about 4% because the market’s dropped so much. Legal fees are 6, 7, 8%, so you have to add that into the overall price. Were there any surprises along the way, any extra payments that you weren’t expecting? Any tips you’d give to people looking to buy a property in France? What sort of research did you do into how you would transfer the funds to pay for the property? 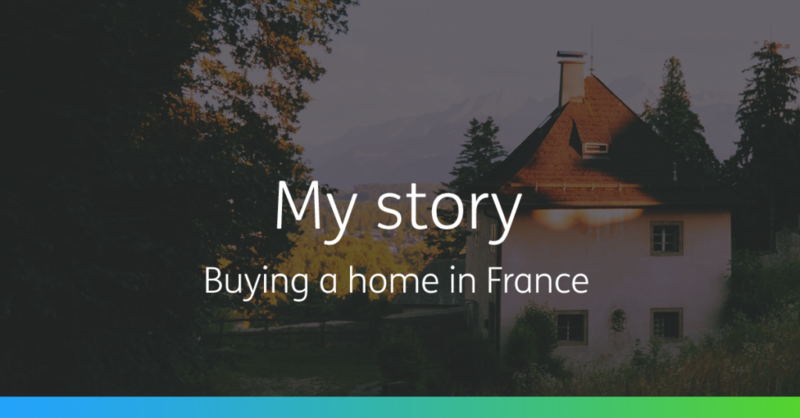 “I did a comparison between World First and the firm I used when I transferred funds for the first house I bought in France. I rang up and asked “what would you give me if I transferred X”, and World First gave me more. Read our full guide to moving to France for more information on the most exciting move of your life. Every transfer has a story… Tell us yours!